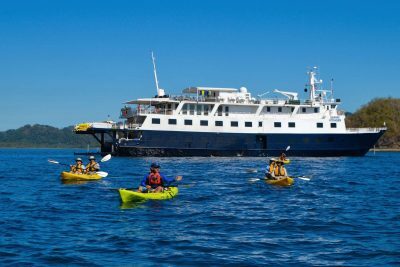 From the verdant jungles of Costa Rica to the man-made wonders of the Panama Canal, this small ship expedition cruise takes in the abundant marine wildlife, ancient indigenous traditions, spectacular coastlines and countless islands of the Pacific Coast. Along the way enjoy guided hikes through pristine tropical jungles, cruise through mangroves, snorkel in azure waters and kayak or paddleboard around rocky volcanic outcrops. Come face to face with monkeys and sloths and tick off numerous species of rainbow coloured birds from toucans and macaws to hummingbirds and roseate spoonbills. Dolphins, turtles and rays can be seen below and sometimes above the water. Against this wild backdrop you will also have the chance to visit a traditional Embera village and learn about the Indigenous way of life that survives in the very heart of the jungle. This provides a fascinating contrast to the historic Fort San Lorenzo and the engineering marvel that is the Panama Canal, completed in 1914. Throughout your journey the expedition team will be on hand to share a wealth of knowledge, making sure you don’t miss a thing as you explore the wonders of Central America. On arrival in Costa Rica you will be met and transferred to the waiting ship. Meet your captain and crew and enjoy a welcome dinner as you set sail along the Pacific coast. At the south-eastern tip of Nicoya Peninsula - in the tangled mangroves of Curu - the cycle of life is evident everywhere. Local residents include everything from exotic birds and deer to leafcutter ants, snake-eating frogs and hungry crocodiles. Land crabs shift in and out of their burrows with such force it’s enough to make the earth move. Hiking trails offer the chance to spot howler and spider monkeys, as well as the immense blue morpho butterfly. An afternoon on the beach provides time to swim or stroll along the shore. Head ashore today to hike through the wild Osa Conservation Area, home to the country’s largest national park, Corcovado. Scenic Drake Bay, named after its discoverer Sir Francis Drake and allegedly still home to the explorer’s hidden treasures, is also known for hundreds of distinct species of plants, trees and animals. An incredible 2.5% of the entire planet’s biodiversity is found here, including all four of Costa Rica’s monkey species, as well as tree frogs, caimans, anteaters, scarlet macaws, coatis, and 16 different species of hummingbird. Today you will take a guided walk through a botanical reserve exploding with vibrant colour. From bromeliads, ginger plants and heliconias, to toucans, hummingbirds, mischievous monkeys, and fluttering butterflies, here you will find a kaleidoscope of sights, sounds, and tastes in every tree and bush you pass. Golfo Dulce is the ‘sweet gulf’ which separates Osa Peninsula from the mainland, and is one of only four tropical fjords on the planet. Bottlenose, spotted and spinner dolphins play here, whilst an excursion by kayak or skiff will allow you to discover the rare flora and fauna of the mangroves. Cross into Panamanian waters today as you sail through the islands of Coiba National Park, making a stop at Granito de Oro islet. Despite its small size the islet offers a little bit of everything: volcanic outcroppings at either end and a dense, mini-jungle in the centre, connected by a pristine white sand beach. Named one of the world’s top 10 diving sites, here you can snorkel among abundant marine life, kayak around rocky headlands or lounge on the warm sand in the company of hermit crabs. Continue to the National Park’s main island, Coiba, to stretch your legs on a hike through the jungle. With luck you may find mantled howler monkeys, scarlet macaws and two turtle species here. Today you will cruise along the south coast of Panama. There may be an opportunity for a snorkel or kayak before you settle down on deck and watch the world go by, keeping your eyes peeled for wildlife along the way. Cruise through the diverse isles and atolls of the Gulf of Panama, home to hundreds of avian and marine mammal species. Your guide will provide presentations and your Captain will determine the best locations and activities for the day ahead based on what nature delivers. You may even be lucky enough to spot a silvery glint streaking across the water – the unbelievable sight of mobula rays taking flight. The timeless Darien Jungle is best explored by motorised canoe, cruising the Mogue River in search of colourful roseate spoonbills, ibises and osprey, as well as raccoons fishing from the water’s edge. Delving deeper into this mysterious, almost mythical place, you will meet the indigenous Embera people, who will share their traditional customs, stories, songs and dance. Discovered by Spanish conquistadors and named for the flood of pearls found, the 90 islands and nearly 130 islets of the Pearl Islands are now almost entirely uninhabited by humans and instead boast a plethora of tropical flora and fauna. Here you can enjoy superb bird watching on a skiff cruise around Bartolome Island’s bird sanctuary, home to frigatebirds, brown pelicans and yellow warblers. There may also be time to explore further with some snorkelling or by kayak, paddleboard or skiff. This evening you will experience one of the modern wonders of the world as you transit the Panama Canal. This feat of engineering spans around 50 miles and takes 8 hours to navigate as you cruise from the Pacific Ocean to the Atlantic. Your final day includes a visit to the UNESCO World Heritage Site of Fort San Lorenzo, built in the 1500s by the Spanish crown as a military stronghold and sacked multiple times by swashbuckling pirates. Tonight enjoy a Farewell Dinner and a slideshow presentation from your expedition team, to celebrate the highlights of your adventures in Central America. After an early breakfast you will disembark the ship. Your transfer will take you via the Agua Clara Visitor Centre with the chance to take in views of Lake Gatun and the newly expanded locks, before your expedition ends and you say farewell to your fellow-adventurers. All voyage itineraries are intended as a guideline only - embracing the unexpected is part of the legacy of expedition travel. Actual routes and landings will be dependent on wildlife sightings and weather/sea conditions. A degree of flexibility is essential! A home away from home in the tropical climes of Costa Rica and Panama, the Safari Voyager is equipped for adventure on and in the water. This rare expedition voyage through the fjords and narrows of Chile takes you into remote and relatively unexplored worlds of wild mountains, pristine glaciers and ancient island cultures. Enjoy a leisurely exploration of Indonesia’s fascinating islands on this small ship cruise from Singapore to Darwin. This spectacular expedition cruise explores one of Australia's remotest regions.